Schools are back in session, and with them millions of American children who struggle daily to learn using traditional printed books. Having learning disabilities or various learning differences, they need alternative reading environments that rely on their strengths rather than on their weaknesses. This includes accessible educational materials, such as e-books that can be used with computers, or mobile devices that display enlarged text or read the book aloud while also highlighting text. We have the technological innovations to help these children and their families and educators, who are looking for strategies to aid their success. Yet, we are still far from where we need to be in order to give them equal opportunity to succeed in school and beyond. I originally started this blog as a way to keep more of our Benetech team aware of what was going on with me and other team members (through guest blogs) while on our travels. Many of us spend a big chunk of our time on the road rather than in the office, and it's good to share some of the reasons our office chairs are often empty! Speaking publicly is an important part of our work. We do it both to advance Benetech objectives and projects, as well as advancing the field (we call these karma gigs). We invest in public speaking coaching (thanks, Melinda Henning!) to become better speakers, both for old hands like me and Benetechers getting ready for their first public speech. Gerardo Capiel, Benetech's VP Engineering, just sent me a couple of exciting screen shots on our Read2Go iOS application for accessible reading of ebooks. 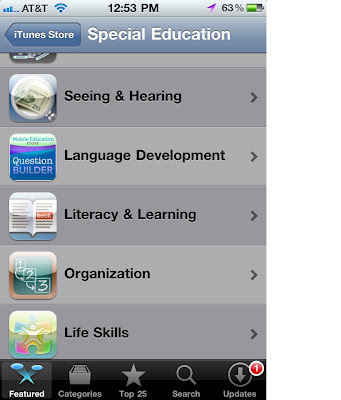 The first one shows the Special Education category on iTunes, with the Read2Go logo being used to represent the Literacy and Learning section. And, the second one shows why: our Read2Go application is at the top of the Literacy and Learning section! We also are just about through the process with the first major upgrade to Read2Go since its release, with a bunch of fixes and improvements requested by our users. We’ve been exploring the area of sustainability a great deal lately. We have some new ideas for software Benetech could be developing. But, one of our core values is to see what’s already out there and to not duplicate great work already being done. That means we frequently run into cool projects (and mentally check the box: taken care of!). In this exploration effort, thanks to John Danner, the incredibly connected entrepreneur who hangs his hat occasionally at the Haas Business School in Berkeley, I was able to meet Dr. Ron Dembo, founder of Zerofootprint. Ron showed me a brief demo at TED and we followed up with a more extensive demonstration more recently.